Free Shipping Included! CE Optics 12X50 Monocular Telescope - High Powered BAK4 Prism Scope Smartphone Tripod Mount Adapter, Perfect Birdwatching, Hiking, Wildlife, Concerts by Calu Essentials at C Starr. MPN: MT-796. Hurry! Limited time offer. Offer valid only while supplies last. Are you searching for the most visual clarity from a monocular telescope? CE Optics has you covered. The CE Monocular was crafted with you in mind. Are you searching for the most visual clarity from a monocular telescope? CE Optics has you covered. The CE Monocular was crafted with you in mind. The CE Monocular Telescopes are coated and sealed with an FMC Multi-layered broadband green film to ensure high light transmittance up to 99.5%. Our field of view is approximately 430FT at 1000 Yards. 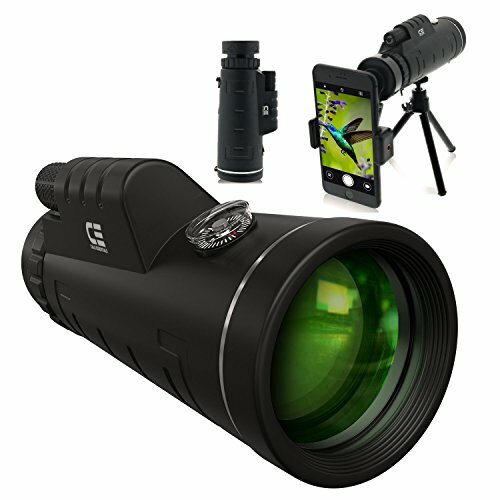 Each monocular telescope is crafted with an internal BAK4 Prism, as well as an FMC-Multi Coated Lens, providing visual fidelity and excellent light sources for travel, hunting, birdwatching, hiking, wildlife,and other outside activities. Our goal is pretty simple. We strive to make monoculars that are powerful, dependable, and affordable. Get yours today by adding this item to your cart! Don't miss out! Zoom on over and click "ADD TO CART" to get your telescope today! CE Optics. Visual fidelity simplified. ✅ MOUNTING ADAPTER FOR SMARTPHONES - Our Anti-Slip Universal Smartphone Adapter can hold your phone with firm and precision as you can zoom and record or take pictures with your phone. It is compatible with the iPhone X, 8, 8 Plus, 7, 7Plus, 6S, 6S Plus, 5, 5S, 4S, SE. Samsung Galaxy S9, S8, S6, S6 EDGE, S5, Sony, LG, and most current market smartphones are compatible as well. ✅ SHOCK ABSORBING FRAME - Our Corrugated Eco-Friendly Rubber Design has been tested and gone through rigorous trials to ensure strong and stable protection for the BAK4 Prism and FMC coated lenses. Our striped and ridged mold ensures comfort and ergonomic efficiency to make functional sense when handling our monocular telescopes. ✅ DESIGNED IN THE US -Based in Houston, Texas, we are an American family operated business. All of our RESEARCH, DESIGN, AND TESTING are done in the US. We strive to provide the best product, customer service, and bundle to ensure that you are getting the best service possible. Your satisfaction is our top priority. If you have any questions about this product by Calu Essentials, contact us by completing and submitting the form below. If you are looking for a specif part number, please include it with your message.